Before you add ANY user to a WordPress site, they need to have a CMS account (if using Blogs, then user must have a Blogs account). If the user does not have a CMS account, then they cannot be added to a site, and will cause confusion to parties involved. A user must have a valid CWL, email address and a CMS account to be added to a UBC CMS site. The diagram below offers an overview into the process for adding a user. WARNING: Adding multiple users at once means that they will all have the same role and invitation expiry date. Users with differing roles should be added individually. NOTE: Email addresses can be added simultaneously as long as they are separated by a semicolon (";"). The UBC CMS platform requires that users have a UBC Campus Wide Log-in (CWL) in order to log-in to the platform. 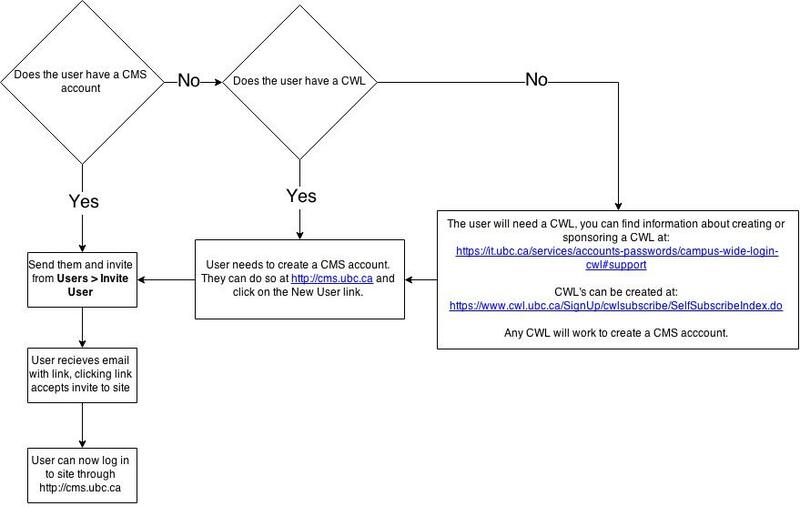 However, it's a fairly straight forward process to sponsor guest UBC CWL accounts. More information on the process of sponsoring a guest account can be found at http://it.ubc.ca/cwl/support/tutorials/sponsor_guest.shtml. katechandler October 8, 2015 at 9:53 am Permalink | Log in to reply. thank you for writing this content – it really helps. I just have one question: your subheadings “user roles” and “invite new users” suggests that these are related tasks, but doesn’t specify how they are related. Does one need to invite a new user before a user role can be assigned? gdouglas September 29, 2016 at 4:17 pm Permalink | Log in to reply. @katechandler, this is really late but I’m responding in case anyone sees this in the future. The user roles are assigned as part of the invitation process but you can change a users role later on. The “User Roles” page explains which roles exist and why you might use one of the specified roles.